Do cash discounts make sense for your business? Find out how to determine if accepting a vendor's cash discount is right for your business's cash flow. By Robert J. Hogan, President, Hipereon, Inc.
On the surface, those sentiments appear logical. However, let’s examine the true cost of not taking advantage of a discount. Terms for common cash discounts include 2/10 net 30 or 1.5/5 net 30. In the first situation, this means you can take a 2.0% discount off the invoice price if you pay within 10 days; while the second states you can take a 1.5% discount if you pay within 5 days. If your business does not have the cash on hand to take advantage of the discount, you may not want to borrow the money as it appears not worth the time or expense. However, let’s see if that is really true. Once you have calculated the annualized cost of not taking advantage of a discount, you can compare that to the cost of borrowing the money to pay for the invoice and take advantage of the terms. For example, if you can borrow money on a line of credit at 8% to 10%, then you may want to do so in order to earn the 36.5% or the 21.9% above. In the case of the $10,000 invoice with terms of 2/10 net 30, you could save 26.5% if your bank charged you 10% on the line of credit. This is on an individual invoice. If you have additional invoices, you can repeat the process on each one. 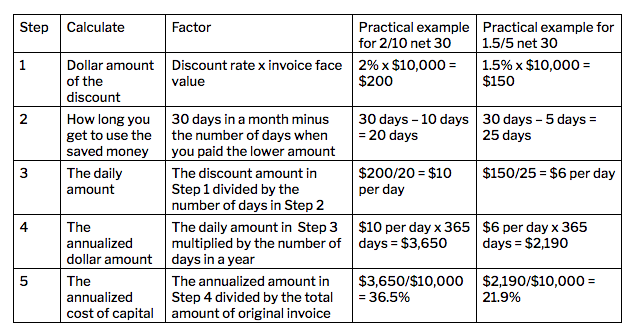 On a 2/10 net 30 invoice you don’t earn 2% or 12%, you earn 36.5% each time. Over the years, the size of discounts have steadily declined. Some companies have discontinued them all together, while others have tweaked their terms. Some now offer a 1.0% discount or less; or you have to pay within two days or less. In both cases, these actions lower the annualized cost of capital, and make the discount less attractive. As a general rule, if you’re being extended a discount, take it — provided the implied cost of capital is greater than the current interest rate being charged.